An earth artist seeks a return to Nature by blending landscaping and art. Land artists as we know them today emerged in the 1960s as a reaction to what they perceived to be a spiritual coldness in the commercialism of modern art and museums. They turned back to the land itself as not only their source of inspiration, but as the source of materials to use in building their earthworks. Ultimately, Nature itself became the display forum for their art, with each work literally emerging out of the landscape as a unique expression of the artist’s personal vision of culture, life, and spirit. Earth artists create both concrete and abstract forms. There is no size limit to the works they create. The more well known works of this genre are massive in size. The Spiral Jetty on the Great Salt Lake, for example, is 1,500 feet long. Each time the lake drops to a very low level, the spiral coil rises up above its surface. In Australia, the Bungil geoglyph uses 1,500 tons of rock to create the image of a bird with a 100 foot wingspan. The largest earthwork in the world consisting of stone sculptures located in 12 different sites and is known as the Rhythms of Life. 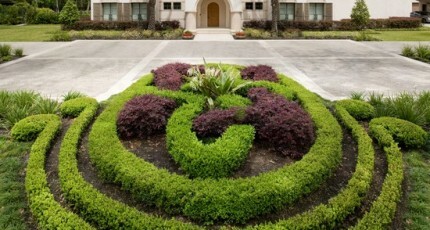 In landscaping design, land art can be a very powerful tool in the appeal to your property. Because the same forms seen in the larger works of earth art can be reduced in scale and scope to fit the size of your yard, landart affords you a very unique opportunity to create a synergetic sense of unity and movement between every point of interest in your yard. Additionally, the vertical impact it creates will make your home stand out from the surrounding flat terrain of the landscape. Ultimately, this can significantly improve the drama and interest through forms that are uniquely individualized to your personal sensibilities. Exterior Worlds earth artists can build these forms with the same materials that are used to construct gardens, flower beds, walkways, patios, and courtyards. The soil itself can often be used as a construction material. Land grading can create berms that function as seat walls, or decorative retaining walls that support colorful vegetation and unique water features. Land works like this add vertical impact to the flat terrain of the landscape. They make a home stand out as a distinguished structure whose importance is magnified by supporting works of art that rise up from the property on either side. Land art can also add very subtle, soothing energies to a landscaping design. Something as simple as a spiral pattern that is made from river rocks can enhance the mind calming effects of a meditation fountain that bubbles up from its central core. Built near a deck or an elevated courtyard, it can draw the eye of the viewer down toward the fountain and the calmer level of consciousness it represents. Our team of earth artists develops each form in relationship to the home and surrounding landscape elements. This keeps the cost of materials within reasonable margins by using what is already at hand. The dramatic increase in curb appeal builds a return on investment into the design by making the property appear warmer, more unique, and more inviting to guests. An earth artist seeks a return to Nature by blending landscaping and art. Land artists as we know them today emerged in the 1960s as a reaction to what they perceived to be a spiritual coldness in the commercialism of modern art and museums. They turned back to the land itself as not only their source of inspiration, but as the source of materials to use in building their earthworks.